The Los Angeles Controller's Office debuted a redesigned website aimed at improving public access to a variety of municipal, financial and performance data, via a new architecture that should be more scalable than its predecessor. 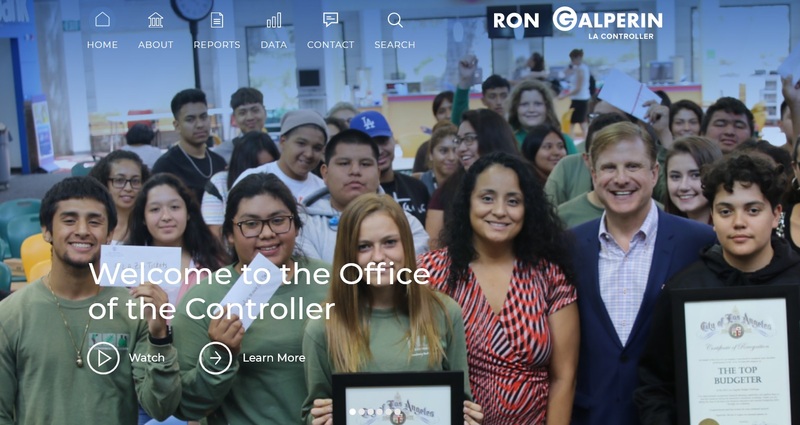 The office of the Los Angeles Controller, whose elected leader, Ron Galperin, is a taxpayer watchdog, and auditor and chief accounting officer for the nation's second largest city, has debuted a new online presence designed to increase transparency and accountability. • The website updates a previously existing site, with a newly designed platform founded on Wordpress. The city of Los Angeles’ Information Technology Agency (ITA) collaborated on it with L.A.-based design and tech consultant Fundamental Design Group. Group principal Jessica Thompson has previously worked with Los Angeles police and fire departments on their websites. The Controller’s Office paid roughly $60,000 for the website’s design, build and launch, which was factored into the office’s operating costs. • One of its main achievements is to improve all open data functions and how existing information streams are grouped and streamlined — making them easier to read and providing a more comprehensive sense of the role of the Controller’s Office. Centralizing this data on a website that could grow was key for the design group. “Our goal was to set them up with a very strong, scalable foundation that they could bring in and continue their good work, but have a template and architecture that would support it,” Jessica Thompson said. • The updated LAController.org continues to link to Galperin’s open-data portal, ControlPanel LA, which features a variety of performance data on how staffers are doing. Information streams include comparing crimes reported versus arrests made, recyclables collected, potholes filled. This, too, was previously available, Ian Thompson said — but not easily accessible. • Working with the Controller’s Office educated her on its data streams and its mission, Jessica Thompson said — something she wonders whether other Angelenos know about.